No sport does rivalries like college football. The games that kick off Saturday go by names like Bedlam, the Civil War, the Apple Cup, the Iron Bowl, the Egg Bowl or simply The Game, meaning Ohio State vs. Michigan. Last weekend there was another The Game (Harvard vs. Yale) and The Big Game (Stanford vs. Cal). College football rivalries are simultaneously everywhere and rare, played only once a year. In the NFL, the Green Bay Packers and Chicago Bears battle twice every season. In college basketball, Duke and North Carolina meet at least twice and often three times if there is an additional tipoff in the ACC tournament. But in college football there’s just one rivalry game, followed by joy—or misery—that last for the next 12 months. Forty-seven years ago Sports Illustrated’s Dan Jenkins rated the sport’s top five rivalries entering the 1968 season: Army vs. Navy, Harvard vs. Yale, Michigan vs. Minnesota, Oklahoma vs. Texas and USC vs. UCLA. Today the list seems quaint, a remnant from a simpler age. Only Oklahoma-Texas continues to gain national traction every year, although the Longhorns’ recent woes have lowered the value of the Red River Rivalry. Minnesota, which was awarded the 1960 national championship and barely missed winning the ’67 Big Ten title, soon was replaced by a certain Ohio university as Michigan’s main rival, even though the Little Brown Jug remains a reward for the victor of the Wolverines and Gophers’ clash. USC-UCLA did provide the most important game of the 1967 season: a 21–20 Trojans victory that helped settle the national championship, decided by a 64-yard touchdown run from O.J. Simpson. USC continued to enjoy football excellence in the ’70s and 2000s, but the Bruins have rarely joined the national title hunt. Army-Navy was once one of college football’s marquee games. The two service academies produced three Heisman Trophy winners between 1958-63, and the ’63 Midshipmen, led by Roger Staubach, ranked No. 2 in the nation. The ’67 Army squad was in line for a Sugar Bowl bid until opposition from the Pentagon amid the Vietnam War squashed a possible invitation. Their annual meeting continues to produce the best pageantry in college football, but the schools no longer chase national honors, and Navy’s recent dominance (13 straight victories) has robbed this rivalry of much of its former cache. Don’t snicker about Harvard vs. Yale. The top Ivy League teams once earned spots in the national polls. The 1968 Yale squad climbed to No. 18 before the legendary 29–29 tie with Harvard. Unbeaten Dartmouth finished No. 14 in ’70. These days, however, the Ivys play in the FCS, and with the conference declining to compete in the FCS national tournament against the likes of North Dakota State or Montana (“Not our kind, dear”) the game known as The Game carries little currency beyond those venerable campuses in Cambridge and New Haven. What current college football rivalries move the national needle or build a potential bridge to a national championship? What match-ups engage not simply two groups of alumni but also a state, a region and, sometimes, an entire nation? The answer has changed over the years. Miami vs. Florida State is not what it was in the 1980s and early ’90s, and Nebraska no longer plays Oklahoma, its main rival in the ’70s and ’80s. Here are college football’s top rivalries, by decade, since Jenkins’ original ranking. The Cornhuskers (1970, ’71) and Sooners (’74, ’75) combined for four national championships in the decade as their annual November meeting usually gave the winner at least a shot at No. 1. The ’71 Thanksgiving Day clash, when No. 1 Nebraska rallied to beat No. 2 Oklahoma 35–31, remains one of the greatest games in college football history. The Huskers played the role of spoiler in ’78, upending the No. 1 Sooners 17–14 by forcing a Billy Sims fumble near the goal line in the final minutes. Oklahoma was college football’s winningest team in the ’70s, while Nebraska finished fifth. During an era when only a handful of college games were televised, Notre Dame-USC usually merited national coverage. Five national championships emerged from this intersectional classic, three for USC (1972, ’74 and ’78) and two for the Fighting Irish (’73 and ’77). Perhaps the most memorable meeting was in ’74, when USC rallied from a 24–6 halftime deficit to defeat the Irish 55–24. 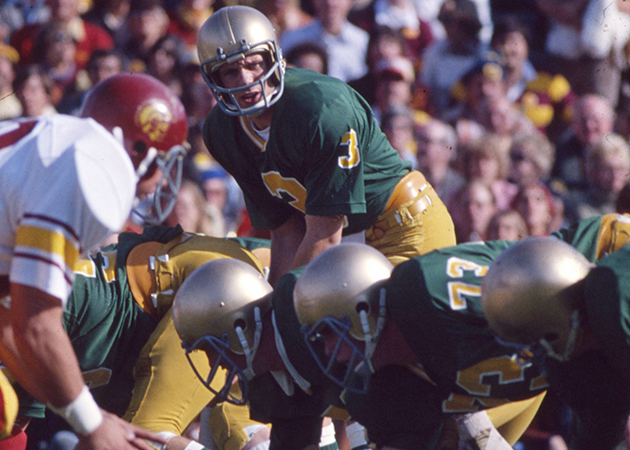 Notre Dame’s 49–19 destruction of USC in ’77 helped make Joe Montana a national name—and marked the return of the Irish’s green jerseys. How important was this rivalry? Between 1957 and ’67, every Big Ten school but Northwestern went to the Rose Bowl. Between ’68 and ’80 only two did–Michigan and Ohio State. The Wolverines of Bo Schembechler and the Buckeyes of Woody Hayes (before he was fired in ’78) played a primal game with scores of 10–7, 14–11, 10–10, 12–10, 14–6 and 14–3. The winning team reached 20 points only three times during the decade. Although neither school won a national championship during the ’70s, both were brutally consistent with Michigan sporting the decade’s third-best winning percentage and Ohio State the seventh-best. Barely on the national map at decade’s start, the Hurricanes and Seminoles produced a series of thrillers with ramifications far beyond the Sunshine State. As the ’Noles became a national power under Bobby Bowden, Miami won national titles under three different coaches: Howard Schnellenberger in 1983, Jimmy Johnson in ’87, and Dennis Erickson in ’89. The Hurricanes finished N0. 2 in ’86 and ’88. In ’80 and again in ’87 failed two-point conversions against the ’Canes cost Florida State undefeated seasons. Miami (second) and Florida State (eighth) were among college football’s winningest programs in the ’80s. This all-Florida rivalry gets the nod over Miami-Notre Dame due to the Irish’s struggles during the Gerry Faust years (1981-85). Perhaps no school has enjoyed a more productive decade with less to show for it than Nebraska in the 1980s. The Huskers were the ’80s’ winningest team (103–20) and featured ’83 Heisman-winning running back Mike Rozier but failed to win a national championship, twice finishing No. 2 (’82 and ’83). Often it was Oklahoma who inflicted the damage, battling Nebraska to a 5–5 record in the decade. The Sooners were more than just spoilers; they sported the decade’s fourth-best mark and won the ’85 national championship. For years the Iron Bowl was a rivalry in name only, as the Crimson Tide won 19 of 23 meetings in 1959-81. However, once Pat Dye arrived on The Plains in ’81 and Bear Bryant left the Alabama sidelines after the ’82 season, the tide, ahem, began to turn. Future Heisman winner Bo Jackson led the Tigers to back-to-back wins in ’82 and ’83, and Auburn posted a 6–4 Iron Bowl record for the ’80s. The Tigers finished the decade with as many top 20 finishes in the AP poll (seven) as the Tide and were the 10th winningest team of the decade. Honorable Mention: Before leaving the 1980s, a tip of the cap to the best finish to a rivalry game when California pulled off a spectacular five-lateral play to defeat Stanford 25–20 in The Big Game of 1982. Cal’s Kevin Moen famously had to weave his way through the Cardinal band to score the winning touchdown. 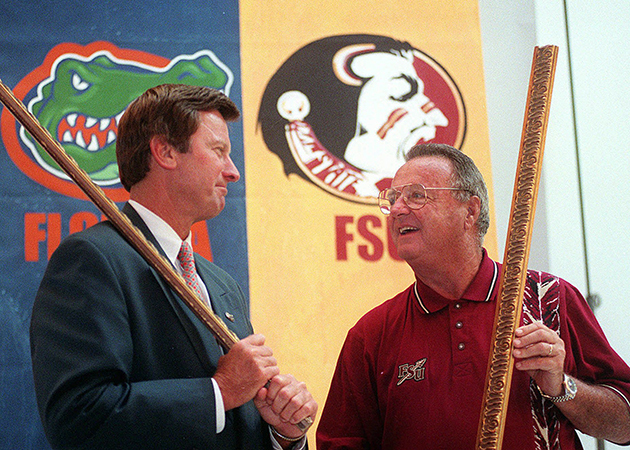 No team won more during the 1990s than Florida State (109-13-1), including national titles in ’93 and ’99. But Florida gave the Seminoles a few headaches, including a 52–20 beatdown for the ’96 national title at the Sugar Bowl. Led by the Head Ball Coach Steve Spurrier, the Gators compiled the nation’s fourth winningest record of the decade, including four wins over Florida State. And Spurrier didn’t mind sticking the needle in his cross-state rival. When eight Seminoles players enjoyed a post-hours shopping spree at a local athletic store, getting $6,000 worth of free gear thanks to the largesse of an unregistered agent, Spurrier joked, “FSU stand for Free Shoes University.” In addition to the three national championships, the Gators and Seminoles produced two Heisman winners: Florida State’s Charlie Ward in ’93 and Florida’s Danny Wuerffel in ’96. While Ohio State’s fortunes ebbed and flowed during the 1990s, including a 2-7-1 record vs. Michigan, Penn State, the Big Ten’s newest member, turned into the Wolverines’ fiercest rival. The two schools combined for 19 top 20 finishes during the decade with Michigan holding a 4–3 edge in head-to-head meetings. The Wolverines’ 12–0 squad of ’97 earned a share of the national championship, an honor that should have been afforded to Penn State in ’94. The 12–0 Nittany Lions were the nation’s top-scoring team but finished one rung below Nebraska in the final polls. Penn State finished as the 1990s’ sixth winningest team with Michigan at No. 7. Maybe the Ivy League looks down on the FCS national playoff, but perhaps never was the quality of football higher than in the 1990s when Youngstown State and Marshall combined to win six national championships. In three straight seasons (’91-93), the Penguins and Thundering Herd met in the I-AA championship game with Youngstown State sandwiching titles in ’91 and ’93 around Marshall’s crown in ’92. Led by wide receiver Randy Moss, the ’96 Thundering Herd might have been the greatest I-AA (now FCS) team in history. They went 15–0, winning every game by a least two touchdowns. The average score of their four playoff games was 48–14. Small wonder Marshall graduated to I-A football in ’97, the same year Youngstown State won its fourth NCAA title of the decade under future Ohio State coach Jim Tressel. Was Marshall moving out of its league? Hardly. The Herd went 13–0 in ’99, led by future NFL quarterback Chad Pennington. They earned wins over Clemson and BYU, plus a No. 10 national ranking. After decades of relative dormancy, the Red River Rivalry roared back to the life in the 2000s as the Sooners and Longhorns combined for six appearances in the BCS title game. Oklahoma won the national championship in ’00, Texas in ’05, thanks to a heroic Vince Young-led comeback against USC. For most of the 20th century, the schools were in different leagues, but the death of the Southwest Conference led to Texas and Oklahoma joining the Big 12 in ’96, adding even more urgency to the rivalry. The Sooners dominated in the early part of the decade, but Texas won four of the last five meetings. Among major conference teams, the Longhorns and Sooners finished 1-2 in winning percentage for the ’00s, and Oklahoma’s Jason White and Sam Bradford won the Heisman in ’03 and ’08, respectively. The so-called World’s Largest Outdoor Cocktail Party served up some mighty potent mixes during the 2000s with Florida (seventh) and Georgia (ninth) among the nation’s winningest teams. The two combined to win eight SEC East titles during the decade and five overall conference championships. Georgia was the more consistent team with nine finishes in the top 25 and five in the top 10 compared to eight and four, respectively, for Florida, but the Gators reached greater heights. After coach Urban Meyer arrived in Gainesville in ’05, Florida shifted gears, claiming national titles in ’06 and ’08. Tim Tebow added a Heisman Trophy to the Gators’ haul in ’07. They also took the head-to-head battle with the Bulldogs 8–2. This rivalry could not have been more even. A 5–5 head-to-head record for the decade and four top 10 media poll finishes for both schools. Miami’s 12–0 national championship squad of 2001 is considered one of college football’s mighty teams. Yet the Hurricanes barely edged the Hokies 26–24 on Dec. 1, needing a stop on a potential game-tying two point conversion in the final minutes and then a diving Ed Reed interception to end Virginia Tech’s final threat. Ultimately, it was the Hokies that halted the ’Canes’ 39-game regular season winning streak with a 31–7 rout in Blacksburg on Nov. 1, 2003. Miami started the decade stronger with the national title in ’01 bookended by No. 2 finishes in ’00 and ’02. But Frank Beamer’s Hokies were more consistent, ending the decade as the nation’s 10th winningest school and with nine top 20 finishes. Not only they do battle annually for Pac-12 North supremacy, but since 2009 either the Cardinal or the Ducks has won the overall Pac-12 championship. Oregon has five top 10 finishes this decade, appearances in the ’10 and ’14 national title games and wins in the Rose and Fiesta Bowls. Stanford has three top 10 finishes and earned spots in the Orange and Fiesta Bowls, plus two Rose Bowls. 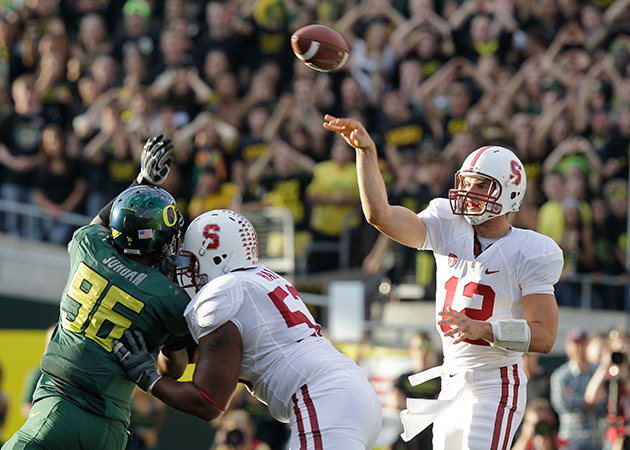 In ’15 the Ducks played the rare role of spoiler, upsetting the Cardinal 38–36 in Palo Alto to diminish their chances of making the College Football Playoff. How important has the Iron Bowl been this decade? Each season the winner has gone to the BCS title game or qualified for the College Football Playoff. Heisman winner Cam Newton rallied Auburn to a 28–27 victory in 2010 en route to the national championship. After three straight Alabama wins, the Tigers pulled off a victory for the ages in ’13, winning 34–28 when Chris Davis returned a missed potential game-winning field goal 109 yards for the winning points as time expired. Davis’s return snatched away the SEC West crown from the Tide and put the Tigers on a path to the national title game. Alabama enjoyed a bit of revenge in ’14 with a wild 55–44 victory that kept Nick Saban’s squad on track for a playoff berth. No, that’s not a misprint. At least at the start of the 2010s, Ohio State-Michigan State has replaced Ohio State-Michigan as the Big Ten’s top rivalry. The two schools have combined for five top five media poll finishes with the Spartans recording wins in the Rose and Cotton Bowls and the Buckeyes winning the first College Football Playoff championship. Ohio State used its 49–37 victory in East Lansing last year as a springboard for its championship run as quarterback J.T. Barrett threw for 300 yards and rushed for another 86. A year earlier, the Spartans ended the Buckeyes’ national title dreams, rallying for a 34–24 victory in the Big Ten championship game that cost Ohio State a berth in the final BCS championship match. Michigan State repeated the trick Saturday, upsetting the Buckeyes in Columbus to end their 23-game winning streak and thrust the Spartans into the thick of the playoff race.